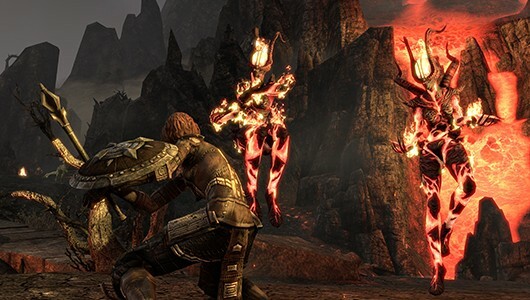 ZeniMax Online’s (or Bethesda’s) decision to make The Elder Scrolls Online a subscription-based game certainly drew the ire of a few Elder Scrolls and MMO fans, but game director Matt Firor believes a sub-based payment model ensures the best possible experience for all players. Speaking with Eurogamer, Firor walked through ZeniMax’s reasoning in choosing subscriptions as TESO’s primary method of generating revenue. He listed two primary motivators: one, to ensure monetization did not interfere with the traditional Elder Scrolls experience, and two, to keep money flowing for future content. When you’re in an Elder Scrolls game, you’re in a world. We don’t want players to hit monetization fees when they’re in the world. It’s like, I go into a dungeon, if I don’t have access to the dungeon it pops up a window: you don’t have access to this, go buy 50 credits. We didn’t want that experience. That’s not an Elder Scrolls experience. So if they are so sure they are going to be able to keep up with an update every 4-6 weeks why not release it as buy to play just charge it as a DLC like TSW and DCU do ? That way players could enjoy what sounds very much a single player game with multiplayer features at their leasure . Or the could also have the option to subscribe and get the dlcs free in the price . Nothing about this games buisness model makes any sense . I think it will be a decent enough game but it will have limited appeal . Just to point out you never hit a payment wall in Rift and pretty much all free to play mmos have an optional sub as well . If you also think about it everything in ESO after your first 30 days is a payment wall . Only unlike in free to play games you don’t have the option to pay as you go . I’m not against subscription payments as long as they are value for money but I’m sorry a game that has very limited pvp and which the developers themselves say is more a single player experience with multiplayer facets than a traditional mmo just isn’t worth 15 dollars a month . Now if it was a third or half that then it may be a different matter . This game will fail hard because Matt Fiors stupidity . I myself think the monthly fee for memo games access as an industry standard needs reform. What is wrong with 4.99 a month or even less per customer? That is double your profit a year for a game. You make your 60 initial cost and follow that with another 60 the player pays over the course of a year. That is about as sensible as it should get and some would say that is too much because what exactly is the monthly fee paying for if I already paid you up front for the game. We’ve heard it all from servers to maintenance costs. What I would really like these so called gaming news sites to do is an report as to the true cost of running an mmo so consumers can see an unbiased view (not just what the industry wants us to know). I honestly think this stuff starts to become greed on the account of the publisher because to justify the cost the start talking about what it cost to pay for each person that worked on the game and what needs to happen to make a profit instead of realizing it is as simple as the fact that the company wasnt making any money and then people gave you money for a product so be happy you were able to convince people to eve!n. buy your product in the first place and pay your folks accordingly.